Driving down the county highway that leads to Pachyderm Studio, it’s only natural to start to imagine all of the rock stars over the past 30 years who’ve made this same curious trek. Although the drive isn’t too long, it’s far enough off the beaten path to leave the cityscape far behind in the rearview mirror—that is, if the aforementioned rock stars were even coming from the heart of the city at all. Did someone pick up Kurt Cobain and baby Frances Bean from the airport and bring them down these dark roads? And what about PJ Harvey, Superchunk, Mudvayne? The commutes for Minneapolis-based bands like Soul Asylum are a little easier to imagine, but the idea of so many hard-edged rock ‘n’ rollers roaring past the sign that reads “Cannon Falls, pop. 4,083” still boggles the mind. With so many iconic ’90s alt-rock albums recorded at Pachyderm—Nirvana’s In Utero, Live’s Throwing Copper, Babes in Toyland’s Fontanelle, Soul Asylum’s Grave Dancers Union—I was expecting the ghosts of grunge rockers past to be hovering all around the remote, woodsy grounds of the studio. But as soon as the van I was traveling in steered its way down the driveway and the bright orange trim of the newly remodeled buildings came into view, I got the strong impression that the storied Pachyderm Studio of days gone by is actually very much alive. To say that the property had fallen into disrepair by the time Kuker purchased it doesn’t quite paint the full picture; it was literally falling apart. A few of us let out laughs of disbelief. Wait, people? Tveitbakk says they started remodeling the smaller building that contains the recording studio first, brought in new equipment, and then quietly started engineering albums for local artists down in the studio while the contractors got to work fumigating and overhauling the main house. The work was finished in early 2014, just in time for artists like Trampled by Turtles, Jeffrey Foucault, and Motion City Soundtrack to load in their luggage for month-long stays. As we move around the balcony of the airy, two-story living room, wander past the fireplace made famous by Nirvana’s only photo from their Pachyderm sessions, and congregate around a mid-century modern hutch in the dining room, one thing becomes glaringly apparent: every aspect of the building’s original 1960s aesthetic has been lovingly restored, right down to the rust-colored lampshades and flawless wood paneling. A hidden downstairs tiki bar opens to an opalescent black-tiled swimming pool, and retro-outfitted bedrooms wait around every corner. With enough beds and couches to sleep a dozen people or more, it’s easy to see why most bands choose to live on the grounds while recording their albums. Okay, this is the best thing ever. We were told the color scheme in that room (the foyer of the recording studio house) was inspired by a line of 1970s lipsticks. I liked it a lot after they told us that. Drew, it is really sad that from that whole amazing article, that’s what you come up with to say. I bet you are really uplifting to be around. Whoa, hey, don’t take it personally, Adam. My apologies that I only left a negative comment. The article was wonderful as is Pachyderm. I have many memories there – I have recorded there multiple times and have partied there even more and I am so happy to see it being properly taken care of. Unfortunately, I’m just not a fan of the color and that’s my prerogative. I do like it in certain places (like the walls of the A room), but the trim on the outside is just not my style. Sorry to offend. Great article, Andrea. The New Congress recorded their first album at Pachyderm. This video depicts the activities that went down there. Amazing musicians, and an amazing week. Made possible by our friend George who offered up a hearty donation to cover expenses. Thank you for doing a story on this recording studio and house renovation! My grandparents built this house so I have many fond childhood memories of this house. The bones of the house are still intact along with the pine tree motifs. I have to say for the record that back then the carpet was a light neutral and the exterior trim was a more neutral tone that blended with the stone in the house. But my grandparents had some upholstered furniture that had some of that brighter orange/coral/peach color that was typical for that era. It so cool to see it have a second life as a recording studio! Love to see it being cared for again! Some great memories made there. I’m the artist that painted the walls, and the mural in the pool (which was drastically faded by the time this photo was taken). Wow looks wonderfully restored. I did two albums here with Big Wu back around turn of the Century. We partied so unbelievable hard. The renovation is beautiful! BTW I am the artist that painted the mural on the wall and in the faded one in the pool shown in the last picture shown here (pre-renovation). That was when my former boyfriend, Jim Nickel, the original owner still owned it, along with his business partner, my brother, Jeff Olson. The old pool photo is posted in this discussion by Raoul Duke. The renovation is beautiful! BTW I am the artist that painted the mural on the pool room wall and in the faded pool (pre-renovation) in the photo posted by Raoul Duke. That was when my (former) boyfriend, Jim Nickel, the original owner still owned it, along with his business partner, my brother, Jeff Olson. Thank you for keeping Pachyderm alive!! I’ve recorded there and done some shows there. It’s a very important place for me. If you haven’t noticed, Pachyderm generates its own family. Well done on the renovation and I bet the cross country skiing is fantastic around there. Best of luck to the future of Pachyderm Studio. Many new friends were made and many unforgettable times were spent at Pachyderm Studios. 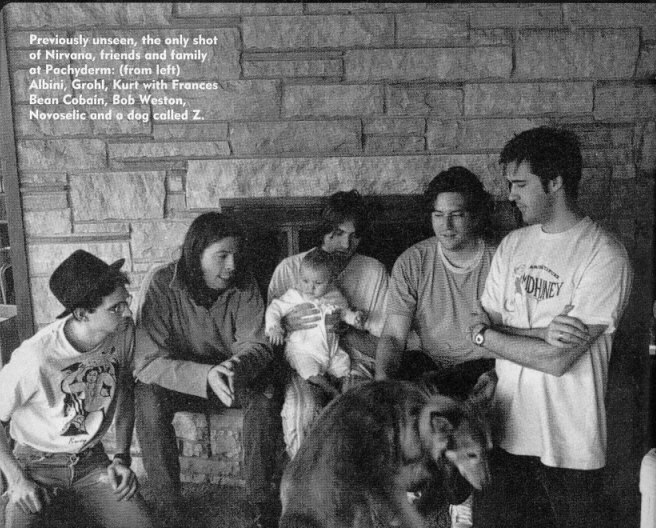 This article and these photos remind me important time spent with two of my closest collaborators, and sadly departed very best friends; former studio owner Matt Mueller (Nov. 25, 1969 – Sept.3, 2012) and Minneapolis music scene Legend Kelly Guttenfelder (Apr. 3, 1961 – Nov. 15, 2011). They and I spent many late nights strategizing, stargazing and bouncing ideas off of each other while we held pow-wow sessions next to the fireplace. Located on the outskirts of Cannon Falls it was an ideal location to record the Minnesota NORML collaboration CD’s. Many of you would agree and took part in much mischief (playful misbehavior or troublemaking – you be the judge ;) ) and mayhem that went on here. I won’t name names of people or bands, however I know this is true for a multitude of us who shared like experiences on the grounds of Pachyderm Studios. This place, this location, has Energy! This is a link to a recent video I came across of the band Goodnight Ritual recording at Pachyderm Studio 2014 – The song is called Shine Me On and there are many good shots of the renovated Pachyderm and its natural surroundings from inside and out. Older video walkthru for Pachyderm Studios and grounds. You can see the transformation from then until now if you watch both this video and Goodnight Ritual’s above. Goodnight Pachyderm, this is not goodbye. I also designed a promotional piece for Pachyderm (cd cover design, mailer, and poster) based on the images in this video. GOOD TIMES! Spent two weeks there in ’99 and walked out with an album. Still looks like home. All the best to the people keeping it going! Here are a coulpe of pics I got at Pachyderm while I was there in October of 2008. . .
My parents, Donald and Marian Mensing of Cannon Falls, had this home designed and built by Herb Bloomberg of Chanhassen, MN during 1962 and 1963. They, along with several of their children, moved in late 1963. My Father’s dream was to build a home such as this on the banks of Pine Creek which flows through the then 40 acres of property purchased from Burt Olson, a long time friend of my Dad’s. His dream came true and he loved every minute of the 24 years or so he lived there. The home served as a focal point for many functions such as family wedding receptions, including mine in 1968, as well as parties and reunions. After my parents’ deaths in 1985 and 1986 the home was sold. I am so happy that it has now fallen into some caring hands that have restored the home to the beautiful property it once was. Congratulations. I Troy Johnson, helped Babe. Ogorman, doing the concrete for the studio. We called the boys the”rocking rollas, the wanted to help, shoveling dirt and setting forms. It was cold out. the “boys” couldnt handle the cold and got an education what it takes to work with Babe. I laugh at the memories and it was cool to be a part of the building of the studio. i never got to see it when it first got completed. I did see it about 7 years ago for just a few minutes. Its the kind of place you just cant appreciate for just a few minutes. You gotta hear the sound to appreciate. I never got to see it but a granite drum room. Im now a guitar player. Unique style, and i got a few songs on utube. Look up.. give into me troy johnson, wonderwall troy johnson, sunday morning coming down troy johnson. I’d love an invitation to come and play there. And im the asphalt maintenance guy…lol. Does anyone know how get in contact with them about possibly tour the studio? I am such a fan of Nick T. and the new Pachyderm Studios! My house is less than a mile from this site. It is wonderful that it has finally been restored with loving hands! The studio is really very nice, too. I am excited for the future of this studio. I remember recording GypsyFoot’s 2nd album Multiformity here in 2008 and it is great to see the improvements that have been made. I hope to visit and record there again sometime soon. I must also say how sad it is to hear about John Kuker’s passing and how strangely mysterious, only 2 and a half years after Matt Mueller’s fatal crash, Pachyderm’s prior owner. My thoughts and prayers go out to family, friends and colleagues of John and Pachyderm studio.